Good location. Place was as shown on the photo. There’s only one airconditioner, that’s on the living room, but it does get cold enough for both bedrooms as long as you keep the doors open. Clean, appliances although we didn't use but it's there if we needed it. This property was pretty much central, clean and comfortable. This is my first time out of the country and the check in process was very simple. Received our deposit back day of check out which was great and unexpected, not complaining at all. Super markets are so close and all the sight seeing destinations are with in walking distant. I had so much fun! Thank you!! Location, friendliness of staff, good size, Brew Dog on one corner and Xurreria on the other, clean, cool old elevator, nice kitchen area, felt like a safe neighbourhood, close to metro/bus service. The apartment was centrally located to everything. It was very accommodating for 6 people. Offered Enough space for everyone. Had great bars and restaurants right downstairs! Old but cute! The place is very suitable for family with small kids. It’s spacious and very clean. It is also near metro and bus stations. Huge apartment with amenities in a central, quiet location. The apartment was large. It had a washer/dryer. It is in a good location. There is plenty of room for a family of 5. 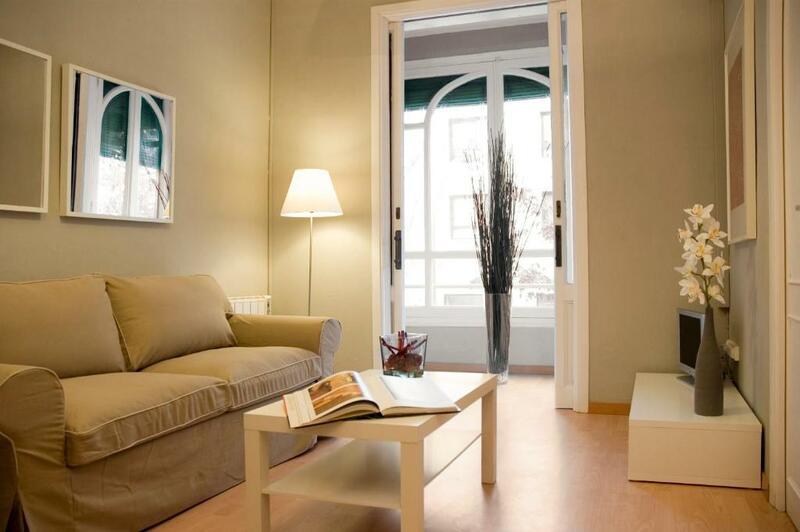 We like the neighborhood and the closeness to the city center. There is a Lidl grocery store very nearby. Prices are great for a family budget. Svetlana is the onsite "manager." She is very helpful and even called a cab for us to get to the port. The Manager, Anna, was easy to deal with and answered all of our questions online before we left. We enjoyed our stay very much. Great property for the price. Great and safe neighborhood and central location. 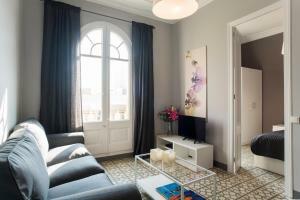 Lock in a great price for Barcelonaguest – rated 8.2 by recent guests! One of our top picks in Barcelona.The recently renovated apartments are conveniently and centrally located in the cosmopolitan L’Eixample district, just 5 minutes from Paseo de Gracia, Rambla Cataluña and Plaza Cataluña. Close by you can visit Gaudi’s famous buildings situated along Paseo de Gracia and the Rambla, and enjoy a good selection of shops, boutiques, cafes, and lively bars and restaurants. The area is also very well-served by public transportation (metro, a number of bus routes and a Renfe train station), allowing hassle-free access to all of Barcelona’s places of interest. 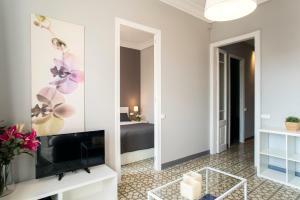 When would you like to stay at Barcelonaguest? 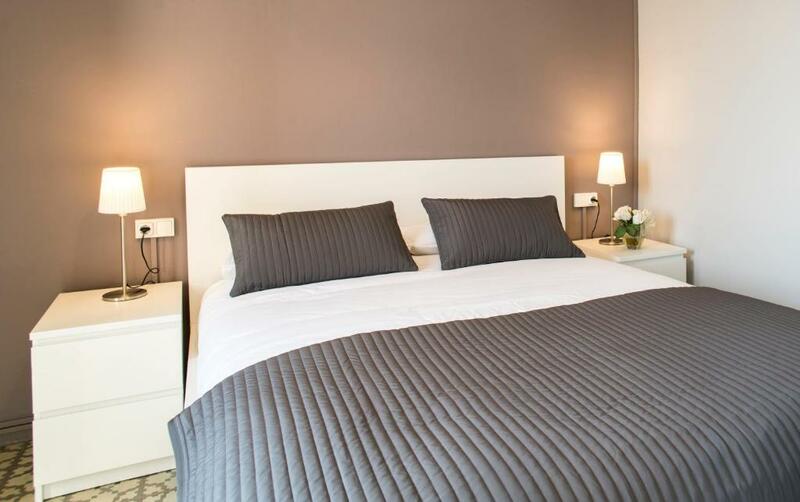 This apartment comprises 1 double room and 1 twin room, a fully-equipped kitchen and a utility room. This apartment has a full kitchen and a lounge-dining area. It also has 2 double rooms and 1 twin room with bunk beds or 1 single bed and a pull-out bed. This apartment has a full kitchen and a lounge-dining area. 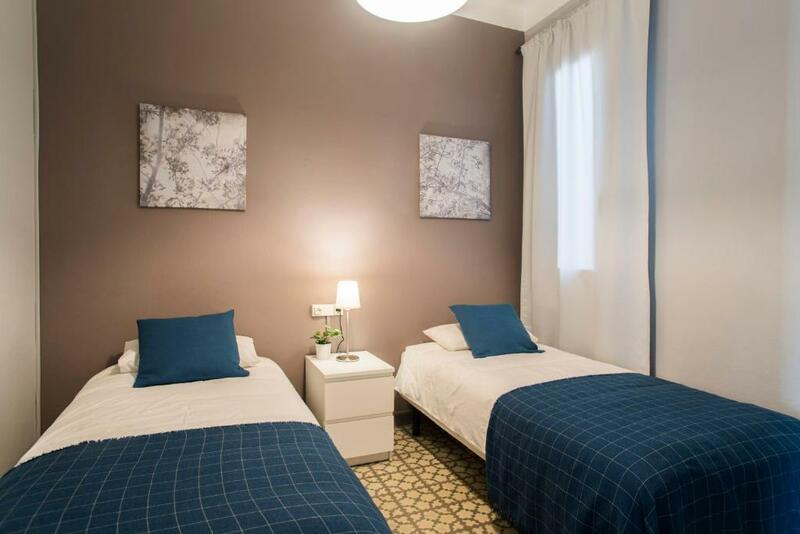 This apartment has two double rooms, one twin room and one single room; or one double room, two twin rooms, and one single room. Los Apartamentos Barcelonaguest entraron en funcionamiento en el año 2006. Anualmente son reformados. 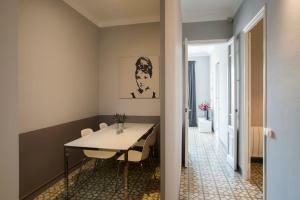 Están ubicados en el distrito de L’Eixample, en el centro de la cosmopolita y dinámica ciudad de Barcelona, a sólo 5 minutos de Paseo de Gracia, Rambla Cataluña y Plaza Cataluña. 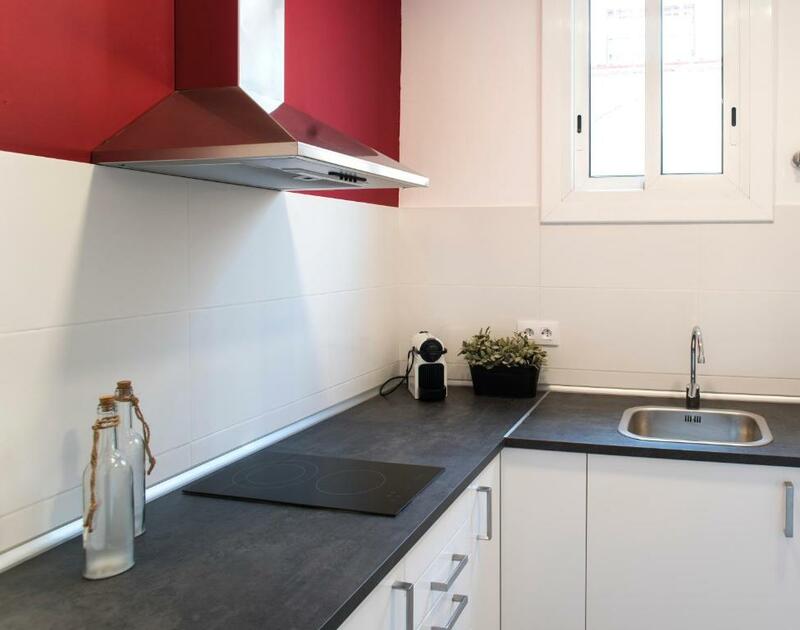 Se trata de apartamentos modernos y completamente equipados. Su situación es ideal para turistas, ya que se encuentran en una zona residencial céntrica y segura. Ofrecen además excelentes conexiones de transporte público. House Rules Barcelonaguest takes special requests – add in the next step! Barcelonaguest accepts these cards and reserves the right to temporarily hold an amount prior to arrival. Parties and loud music are not permitted in the apartments. The management reserves the right to end the reservation of any guests due to complaints on these grounds. No compensation will be offered in these cases. Please inform Barcelonaguest of your expected arrival time in advance. You can use the Special Requests box when booking, or contact the property directly using the contact details in your confirmation. High ceilings and there was an echo. Tv programs very limited, not one English program. should have more kitchen towels. The location is great, not so quiet street, but we had no problem with the noise. The communication with the object was easy and prompt. Lidl is located 100m from the apartment. The apartment is very big, and it is equiped with a lot of stuff. We could check in earlier and leave our luggage a the reception without the extra payment. The equipment of the kitchen could have been better. More pots/pans would be a good idea. The location was very good, very close to multiple buses and metro station. Grocery store just around the corner was also a plus. Communication with the staff was smooth. Would be great if there was an extra bathroom, and mirror. Excellent space and fantastic location. Highly recommend. at the arrival you are obliged to pay 200 eur deposit in cash, which is not stated in the booking. There is no seasonings in the kitchen, and you have to buy sal, oil and so on when you need to cook. Floor in the apartments was EXTREMELLY COLD, especially for little children (due to this we all got cold next days and our holiday was disturbed by this!). It was VERY NOISY(noise was mainly coming from street through very thin windows and also thin walls from neightbours) and cold in the room with double bed so we had to move to another room with twin beds and no windows. All furniture is quite tired. in the shower was no shower gel available. Also there is no oven or microwave in the kitchen. I can't say that it was too bad, but I was disappointed with the quality of stay there. All necessary equipment was available. Wifi was working. Floor was clearly not cleaned prior to our arrival. The floor was covered in small hairs and we found a toenail in the bathroom. Nil essentials such as hand wash in the bathroom. No complimentary offers such as coffee for the coffee machine. €300 euros immediate fine for excessive noise, but could hear noise from other apartments very easily- even conversations. Bed was comfortable and spacious apartment. Shower was hot. Very spacious with everything you need, good location, nice staff, great place all round. The rooms were a little noisy, we were by the lift and you could hear the lift of the night going up and down when it was in use. The property was lovely and clean, the staff were really helpful with everything. Really spacious and had everything you needed in there. If i re-visited Barcelona I would stop here again. Great value for the money. Paper thin walls and floors. Noise from surrounding apartments too much. Could not sleep. Good location close to metro. Wel laid out. Easy check in and out. We had an issue with the bathroom sink, It was blocked and leaking. It was looked into once we reported it. The kettle didn’t work and we ended up using a pot to boil water. Aside from that, all bedding, towels and utensils were provided for. You’ll have to provide your own toiletries like shampoo and shower gel or soap including laundry detergent, if using. 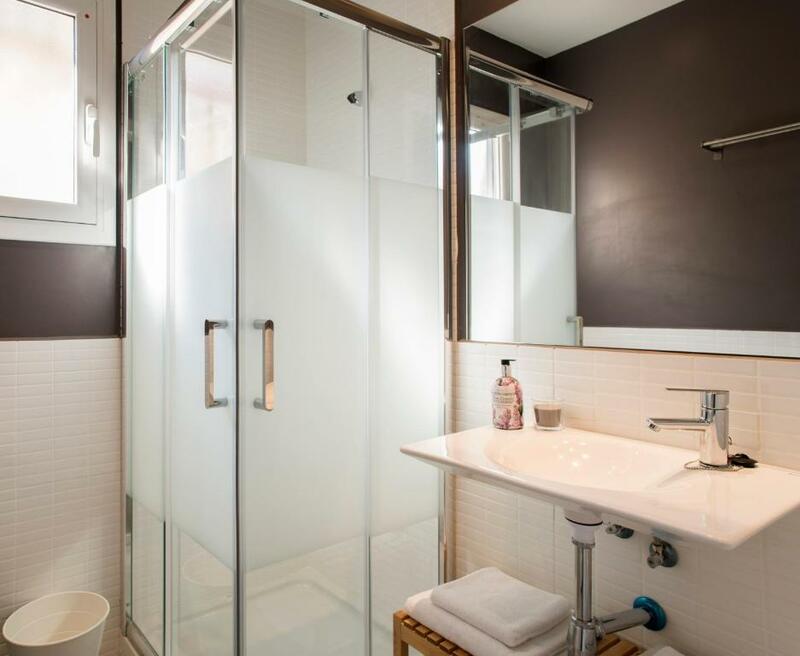 Note, the only bathroom’s shower is inside the bath tub. Great location to shops in Eixample, walking distance to all the must see sights - Sagrada Familia, Casa Mila, Casa Batllo, El Born, La Rambla, Passeig de Gràcia, Plaza De Espanya. Lots of yummy tapas restaurants like Cerveseria Catalana and Vinitus, Japanese restaurants and super markets like Lidl, nearby too. Even a Xurreria churro shop! Beds were soft and comfortable. Friendly hosts. Apartment is on 4th flr, accessed via a lift. There could have been a tourists information booklet which would have been helpful. Loved the apartment and location. Anna was really helpful and also booked a taxi for us upon leaving.